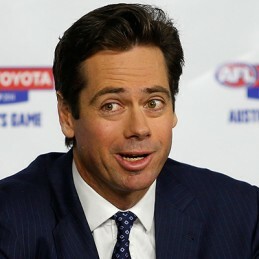 Gillon McLachlan is the Chief Executive Officer of the Australian Football League. McLachlan has been with the AFL since 2000 when he started as a consultant in strategic planning and in 2003 was appointed General Manager of Commercial Operations. In 2006 McLachlan was given additional responsibilities for broadcasting and major projects and in 2008 was promoted to Chief Operating Officer with responsibilities in AFL broadcasting, digital media, fixtures, venue agreements and stadia infrastructure. McLachlan has had key roles in the last AFL Media Rights Deal, the largest in Australian sporting history, the establishment of AFL Media, and establishment of the two expansion clubs; Gold Coast and Greater Western Sydney. Having attained a Bachelor of Laws from Melbourne University and a Bachelor of Commerce from Adelaide University, McLachlan has also completed the Senior Executive Program at Stanford University. McLachlan has three children with his wife Laura.